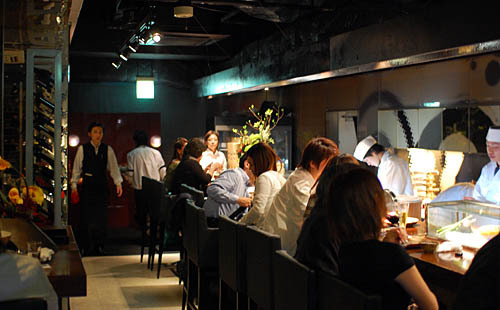 Spectacular "nouvelle Japonaise" cuisine in a stunning modern setting. Standout items on the menu include cold stuffed cabbage kimchee with cashew nuts, minced tuna and Korean bean paste (Y780), sauteed foie gras served on lotus-root cakes (Y1600), and homemade Satsuma pork sausages with a fresh wasabi-mayonnaise sauce. There's also a large a la carte sushi and tempura selection, with items like scallop tempura with green-tea salt (Y200 a piece). The wines are nothing special, but the house sake is a very drinkable Tsukasa-botan at Y1,000 a glass, and there's a full cocktail menu. Plan on spending Y5,000-10,000 per person for a superb meal; reservations are a must. Shinjuku-ku, Shinjuku 3-37-12, Shinjuku Nowa Bldg. 3F.